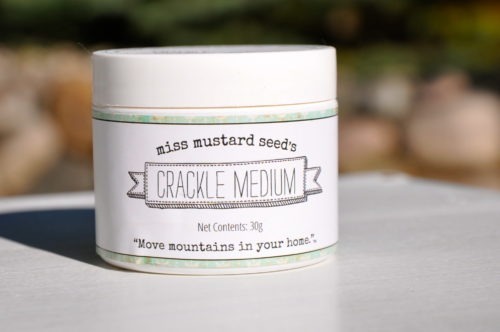 Miss Mustard Seed’s Crackle Medium. What fun! 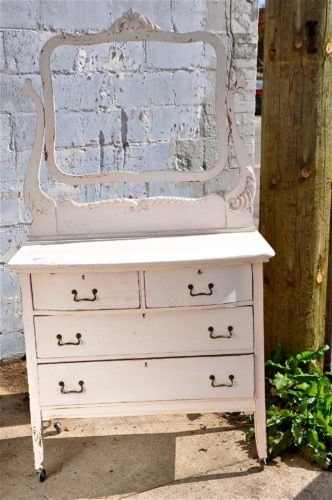 Let’s see what this baby can do… once again I gave this dresser a nice base coat of a pink color that I mixed up using chalk and clay paints. Then I mixed Miss Mustard Seed’s Crackle Medium and applied it to various spots on the dresser and around the mirror frame. I waited until the crackle felt tacky and then brushed on some of Miss Mustard Seed’s Ironstone as a top coat on the dresser. It blended with my custom pink perfectly and when the cracks started showing up – WOW!! It is aged to perfection. Can you see the faint hints of the pink? It looks as if it’s been there for years. I finished this piece with Miss Mustard Seed’s Furniture Wax and buffed it to a nice shine. 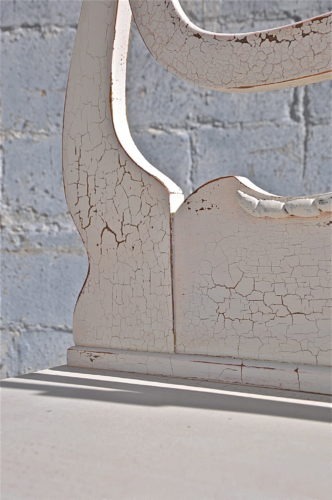 What a yummy shabby chic look. You did a wonderful job mixing the paints to get the right color and the crackle. 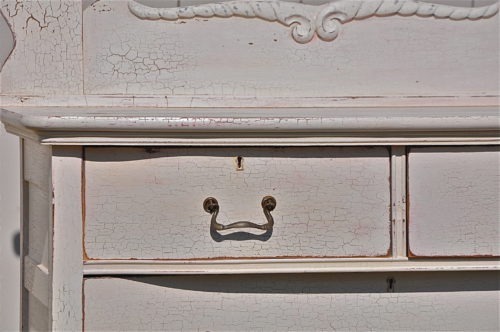 The pretty dresser has a nice aged look to it now. Some one is going to love it. Thanks so much. I was pleasantly surprised to see the colors blend like that. 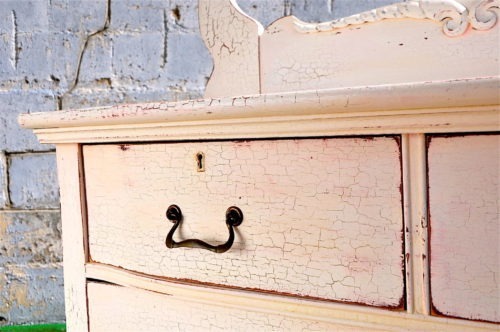 The Ironstone color is a wonderful topcoat over color – kinda like a wash.
Did you use the crackle all over or just in certain areas? Also, did you sand it or did the larger pieces come off with the crackle? I used it in just certain areas. I did do some sanding too and hit it with a hair dryer to help the cracking along. Having a base coat of CeCe Chalk/Clay paint helped the MMSMP stick and the Crackle Medium kept it from just peeling right off. very beautiful, and very authentic looking ageing process, thanks for sharing that! This looks amazing!!! Just pinned it to share. It’s perfectly sweet. Kudos to you for your techniques! How does the MMS wax compare to CC wax? In price, coverage, ease of use, toxicity? Are they interchangeable? I am curious about the hemp oil as well. When would you use it rather than wax? Comparing MMS and CC wax… at Bungalow 47 we offer CeCe wax for $26.95 and MMS wax for $20.00. The CeCe wax comes in a 10 oz. jar and MMS is 7 oz. I would say that the CeCe wax covers more than the MMS but coverage will depend on how much is used during application. The are both super easy to use. The CeCe wax is an all natural wax and has (in my opinion) a lovely smell. MMS wax has a slight order but nothing harsh. I’m not sure about whether or not they would be interchangeable. Hemp oil is an all natural product and provides a very durable finish. 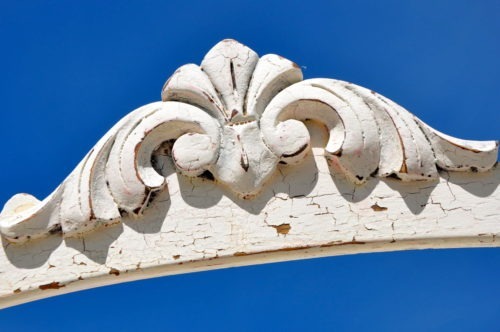 I do not recommend hemp oil on CeCe paint, just on milk paint. I use hemp oil when I use milk paint. 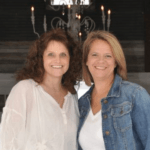 Hope this answered your questions Teri. Thanks for commenting.